We as human beings love to analyze ourselves and figure out why it is we do the things we do. There are a number of personality tests out there, all designed to provide insight into our behaviors, one of the most well-known of which is the Myers-Briggs, or personality type indicator. I recently took an abridged version of the Myers-Briggs online and was intrigued by the results, which then led me to wonder how it could be applied to finance. 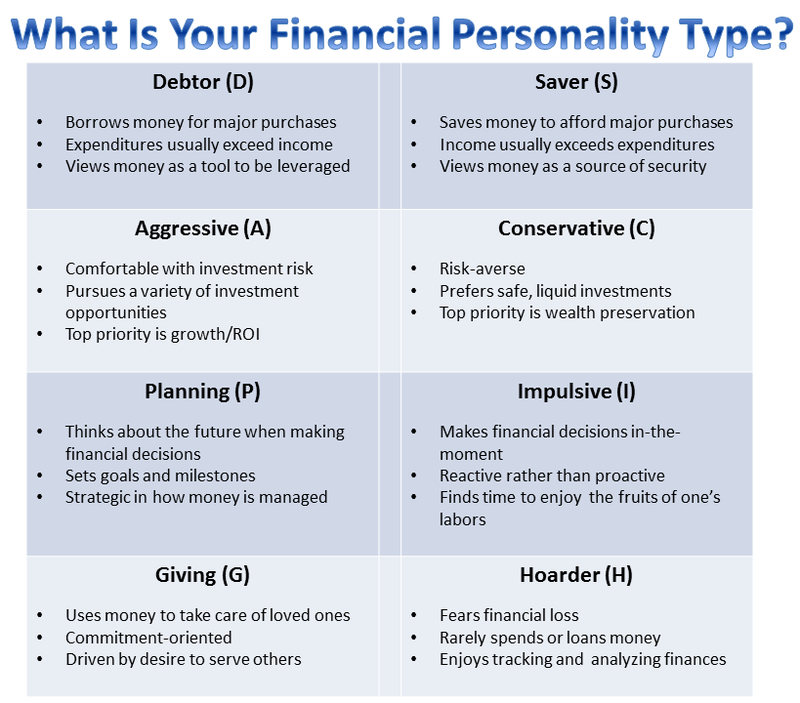 So I decided to create our own financial personality assessment inspired by it and help others identify their money management styles (keep scrolling to see all the financial personality types below). What Is the Myers-Briggs Personality Test? The Myers-Briggs test is officially known as the Myers-Briggs Type Indicator, originally developed by Katharine Cook Briggs and her daughter, Isabel Briggs Myers and based on psychological theories proposed by Carl Jung. In short, the Myers-Briggs test divides personalities into four dichotomies, each type represented by a letter, for a total of 16 different possible personality types. Extroversion (E) / Introversion (I): Do you prefer to focus on the outer world or on your own inner world? Sensing (S) / iNtuition (N): Do you prefer to focus on the basic information you take in or do you prefer to interpret and add meaning? Thinking (T) / Feeling (F): When making decisions, do you prefer to first look at logic and consistency or first look at the people and special circumstances? Judging (J) / Perceptive (P): In dealing with the outside world, do you prefer to get things decided or do you prefer to stay open to new information and options? Individuals are assigned four letters that represent which personality characteristics fit them best. For instance, I am an INTP based on these various preferences, which means I am more quiet, thoughtful and analytical than my outgoing, touchy-feely peers. But how can this personality assessment be applied to financial personality? Let’s find out! What Financial Personality Type Are You? Based on the ideas above, we came up with our own financial personality type indicators. The chart below will give you an indication of which letters represent your financial personality, which is followed by in-depth explanations of each. Debtor: If you fall into this category, you borrow money to make major purchases rather than saving up the necessary cash. These personalities always owe money in some fashion, whether it be credit cards, student loans or mortgage with a large principal. For Debtors, expenditures are generally greater than their incomes — this can be because they have poor money management skills, are rarely prepared financially and therefore, reliant on others to cover their expenses. On the other hand, they can also use their debt strategically, borrowing money to take advantage of high-yield opportunities that will pay off later. Debtors would generally like to enjoy a standard of living higher than what their present incomes allow. Saver: Savers do not like to owe anyone money and would prefer to own things outright, even if that means living according to a strict budget. They cut expenses to ensure they have a positive cash flow, and go without when they run low on money. Savers view a safety net of cash as exactly that — security against financial emergencies or unknowns. However, this doesn’t necessarily mean they are afraid of risky or illiquid investments; Savers ensure they have money for now and for the future, investing with the goal of remaining comfortable financially at all times. Aggressive: David Harra, Senior Market and Investment Analyst for Pryce Warner International Group, explains that people who have an aggressive investment approach are looking to earn income through their investments, therefore favoring high risk, high-yield funds. They are also very open to new or uncommon investment opportunities, such as futures, commodities and currency. “Aggressives” work much more for the present than the future, and are often managing money in a way that maximizes present income with little regard for long-term savings.”They often have, or desire, a high disposable income lifestyle, so they like to take bigger risks in order to enjoy short-term gains,” says Harra. Conservative: On the flip-side, Harra is also very familiar with the conservative end of the spectrum. He explains, “These individuals are very risk-averse and generally manage their finances so that they can never lose money.” Conservative investors tend to place a large proportion of their income into savings accounts, a mortgage and low-risk private or company pensions. Conservatives are very “rainy-day” conscious and skeptical about unknowns, which means they would almost prefer negative growth from a safe, familiar financial product like a savings account over positive growth in an unfamiliar, personally-untested financial product. Harra also notes that these types’ favorite form of investment is generally property. Planning: Xavier Epps, Financial Adviser and Owner of XNE Financial Advising, LLC, says Planning types seek out the opportunity to save money and take strategic steps to do so within their household budget. “Many Planners are great at looking at the future and seeing what needs to be done today to get where they want to be at financially tomorrow,” says Epps. Planners are also very good at identifying and prioritizing the various goals money can be used to accomplish, both short-term and long-term. They will set benchmarks and timelines for everything from building an emergency savings account, to taking a family vacation, to retirement. That said, Syble Solomon, who is an expert on the psychology of money and founder of LifeWise Strategies, advises that while Impulsive types are not typically associated with being good with money, that isn’t necessarily always the case. “These people often have a great strength that others don’t in terms of being able to make quick decisions about spending,” she says, adding “That could be buying a house before someone else makes a bid or jumping on an investment before it goes up in price.” Solomon also remarks that an Impulsive type advocates using money for pleasure, like taking a vacation and enjoying the fruits of one’s labors in general. Giving: Joe Duran, CEO of United Capital, explains that the Giving financial personality is driven by a desire to take care of the people or causes they love. “Their primary quest is to find ways they can serve others and help,” says Duran. He notes, “Regardless of the amount they have saved, their level of income, or the opportunities presented to them, they find that there is always more they can give to those they care about most.” Of course, while the generous nature of the giver is admirable, the trait can also become a fault if they allow others to take advantage of their generosity. Often, those who fall victim to charity fraud and similar scams have a Giving financial personality. Hoarder: On the opposite end, a Hoarder does not like to part with money if at all possible. Gordon Veniard of thevenworks.com says that they are a financial personality type “for whom money is a resource to be protected, treasured and analyzed on a regular basis.” Veniard adds, however, that this tendency usually stems not out of greed, but rather caution. Hoarders are driven by fear of financial loss, thus avoid situations that require parting with their money. Spending and lending money to friends and family are behaviors Hoarders rarely participate in. Using these expert analyses of the various financial personality types, tell us your financial personality type in the comments below. Do you agree or disagree with the assessment? Save money on common household items by going the DIY route. What’s Your Recession Spending Personality?